Oh celebrating mom is right around the corner. We are offering some of our top favorites. We can take out of town calls….deliver certificates…prebook…so many ways to get mom what she deserves for Mothers Day. Email or message the spa. The benefit of Himalayan salt stones – salt stone lamps for improved sleep and energy, salt stone grill slabs for natural infusion of spices, etc. Hot stones have long been used to enhance the effectiveness of therapeutic massage and now the Wellness Spa can give you the option to add Himalayan salt stone to any massage. The use of hot stones and relaxation dates back to 27 B.C., and for millennia, has been recognized as the most relaxing of all massage. The heat of the stones relaxes muscles groups in the body to allow therapist to more directly impact tension and trigger points. Additionally, the Chinese believe that Hot Stone massage could be used to directly impact proper functioning of internal organs. Our therapist is 5 star rated and voted Best in Florence. Our Pedicure Department is offering this pampering Strawberry Banana Milk Pedicure. Dip your toes into a dreamy cream soak, with coconut and whole milk, almond oil and chicory root to soften and soothe. A shea butter and coconut water scrub polishes to reveal silky soft soles! Time to show off and break out those flip-flops! A scrumptiously scented mask, crafted with real banana and turmeric extract is painted on – this is one delicious, skin-tightening stunner. A massage with whipped shea butter, aloe and live strawberry fruit cells brings tootsies to their best and brightest. Top it off with our exclusive vegan, non toxic nail polish. Our Facial Department is offering a treat for our anti aging regimens. Skin tightening, and luminous. Banana Slammer Wrinkle Eraser Facial. Let’s get this spa-rty started with a nourishing coconut milk cleanser to prep and rid skin of makeup, sunscreen and mascara. A rose water and aronia fruit extract is misted onto your complexion for the ultimate fresher, before a shea butter and sugar crystal buff gently cleanses and removes dead skin – clearing the path for a banana and turmeric extract mask to tighten, tone and heal. You will feel a tingle as the extracts help to erase the look of fine lines, bring a healthy glow and create a temporary tightening effect to your face. A peptide-enhanced brightening serum is applied to skin. Then a botanical milk hydrator, infused with time-release retinal, is paired with an under-eye serum to erase the look of crow’s feet, revealing an even more wonderful you! Oh my!! The spa has expanded into a wellness SPA. We would like to show you the major changes we have made to our product line and service menu…. We will be raffling free products every 30 minutes…offering specials for prebooking for facials, massages, and any of our new services. Speak to our skin care specialist to get a regimen for your skin, written on our skin care RX, you will have notes, and guides on your new purchases or samples! Skin care samples will be available with a consult with our skin care specialist. Best selling anti aging, once again Organic or Natural. We want to offer shopping for our clients, with the upcoming holiday. There will be major shopping opportunities with our brand new Lavish Diva Stock, Farmhouse Fresh stock to mention a few. Our gift with purchases are top notch, we will post in the next week or two the shopping promotions. Farmhouse Fresh has sent samples for every person who attends…now you can take it home!! These bottles are amazing, we will post a photo…we will have enough for everyone! This body oil is award winning…. We look forward to seeing our favorite clients, and friends. Much love. With your help we made a decision on the new nail line…..
AS…we begin to work on our wellness….we are going as chemical free as possible. Our Pedicure and Facial departments are currently all ORGANIC AND CRUELTY FREE😍😍Now it’s time for the nail room to get a makeover…. From NEW YORK CITY…WE BRING YOU THE Sundays line. 🔥🔥 award winning….high end…and dries so fast…this will make your pedicure and manicures much easier to leave when dry. Our nail polish collection is 10-free, nontoxic, cruelty-free, and vegan. We spent a whole year perfecting our formula to create one of the simplest and purest on the market that still delivers long-lasting strength and shine. sundays’ NYC nail polishes are formulated without dibutyl phthalate, toluene, xylene, ethyl tosylamide, camphor, formaldehyde, formaldehyde resin, parabens, and tert-butyl hydroperoxide. They are also free of ingredients derived from animals. sundays’ nail polishes are 100% free of animal byproduct. Did you know that some pigments, shimmery and metallic shades are derived from animals? For example, red dye is commonly made from a type of insect shell. If an ingredient list includes carmine, cochineal extract or Natural Red 4, that red color is coming from ground cochineal insects. And that shimmery, pearly, or luminescent finish? Often an ingredient called guanine (aka fish scales). sundays’ nail polishes are not tested on animals. We don’t need to sacrifice the lives of our furry friends for beauty! There is a chance to WIN A BOTTLE OF THIS new product. Go to our Facebook page to enter. Winner will be drawn on September 1st. Welcome to one of the best spa lines in the United States. Highly awarded, celebrity loved, the farm is the place to be! This company is from Texas, the farm they operate is the foundation to this amazing product line. When researching a company for new products our wellness spa is striving for excellence. After testing most of the products, with family, clients and friends…we decided to jump on board with this amazing company. WE DO OFFER SHIPPING IN THE UNITED STATES!!! At FarmHouse Fresh, you’ll find skin care products grown and crafted with delicious epicurean flair, that are either certified organic or use up to 99.6% natural and naturally derived ingredients — all chock full of fruits, vegetables, milks, and more from U.S. farms, including our own. We are proudly made in the U.S.A. We put just as much love and care into our products as we do in cultivating what goes into them. Our baskets, table top displays, even tote bags are all hand-made in the U.S.A.
-Organics Collection received Day Spa Magazine’s Professionals Choice Award. We are specializing in the Organics for body, and all natural anti aging facial products. The new skin care line was so popular we sold the first order in two weeks!!! The products are gentle and customized to your skin care needs. This glistening oil for body and face contains a pristine assortment of high-linoleic acids, essential to help balance skin’s oil production and maintain skin’s barrier function. Plus, Blue Agave Leaf extract stimulates hyaluronic acid production, so you will enjoy reduced dryness, a plumped appearance, a dewy glow, and a decrease in the look of wrinkles. If you love our Agave Nectar Oil, you will love Blushing Agave. The scent is similarly light and delicious, and reminiscent of red berries and cream. This rich, creamy honey-butter is whipped from golden organic honey and glistening organic sunflower seed oil for a silky soft feel that deeply nourishes even the driest of skin. It’s high in essential fatty acids and vitamins A, E & B, for quick penetrating, long-term moisturization. Our team loves to apply this to our legs and arms – the butter has a thick and luscious consistency that lasts for hours! Come back soon to read our blog with the facial products we are now carrying at the wellness spa. Our skincare department is expanding into more advance services. Our anti aging and acne clients are now able to step up treatments using our new LED light treatment systems. Professional strength LED lights, that work on both acne, and anti aging. This is different from our high frequency machine we have on site. LED stands for Light Emitting Diode, which is a tiny computer chip encased in glass. Each LED wavelength (color) of light provides unique therapeutic benefits. LED is non-invasive, painless and requires no recovery time. This Light is good for all skin types and is engineered to emit a soothing gentle warmth. Just like plants, our skin and other body tissues have the ability to absorb light and convert it into energy. LED light therapy delivers light energy in a similar way plants absorb light energy from the sun. Emits UV-free, beneficial light rays that energize cells and stimulate the body’s natural process to build new proteins and regenerate cells. Each LED product is composed of different wavelengths, or colors of light. When this beneficial light is applied directly to the skin it can help to increase collagen and elastin production, reduce inflammation, speed healing, increase circulation, and destroy acne bacteria. This LED light treatment is FDA cleared to treat wrinkles on the entire face. You can treat your forehead, crow’s feet, cheeks, nasal labial folds, jawline, and even your lips. In FDA clinical studies 100% of participants showed improvement in their fine lines and wrinkles in just 8 weeks. With red light therapy your skin is now nourished by your own body, that produces more collagen and thus fills the fine lines and wrinkles. Your skin becomes smoother and younger naturally. It’s also healthier, overall and you will see a better skin tone. With blue light therapy for acne, since it helps accelerate wound healing by enhancing collagen production. This means that it can help to reduce the appearance of acne scarring, and heal the existing acne lesions that have formed under the skin. All of our acne facials will now come with LED treatment. This information was provided by our manufacture of our LED therapy products. Sessions can me added on to any facial (included in the acne facial) or microdermabrasion session for $10. 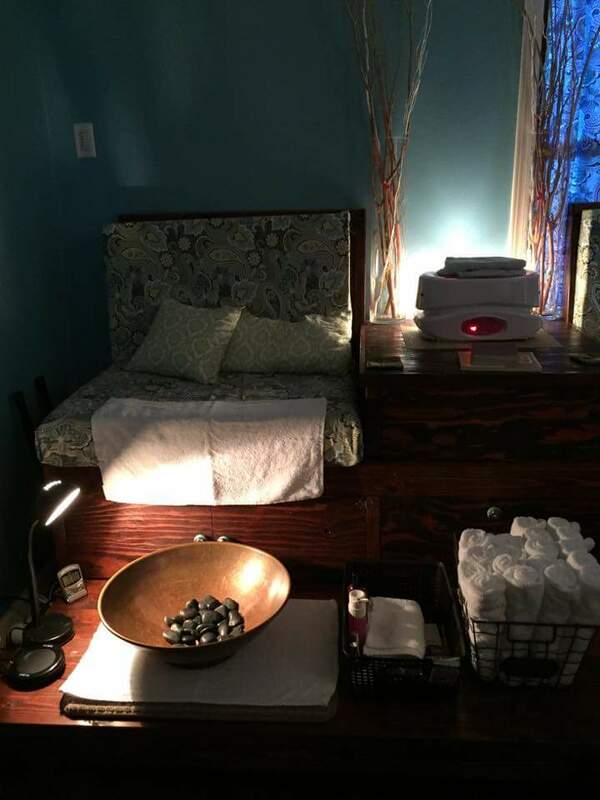 LED only sessions include facial wash, treatment, serum, moisturizer $40. We are so thrilled to announce the newest facial at the day spa! Seaweed Facials. Bringing the gift of the ocean into our facial room. Seaweed grows in the ocean and is rich in antioxidants, fiber and Omega-3 fatty acids. This facial is great for ALL SKIN TYPES. The main focus with this facial is to hydrate, exfoliate, and help the skin cells turn over quickly for that GLOW. Seaweed protects the skin from the harmful effects of pollutants, which makes your skin prone to environmental damage. Seaweed is rich with antioxidants that protect your skin from the damaging effects of free radicals. Ascorbic acid and selenium in seaweeds have anti-aging properties. Seaweed contains organic iodine that helps in increasing skin metabolism. Fatty acids contained in seaweed help to put up with skin inflammation and irritation. Seaweed has natural cleansing and hydrating properties. Our Treatment: This four layer treatment involves a thorough cleansing of the face, a gentle massage, application of a soothing seaweed facial mask, followed by a facial treatment with thermal mask enriched with minerals. You can get this facial at the day spa for $70 per session. We promise it will become your favorite skin pick me up. “The London” is a revolutionary technique from London that adds length, volume, and lift to your natural lashes. No lash extensions, no need for curling rods or mascara… You can have the same incredible look celebrities are raving about. With these Lashes, you can achieve a more natural, chic look because it allows you to make the most of what you already have without the need for eyelash extensions. London Treatment – lifting treatment , is designed to enhance your natural lashes by straightening them rather than curling them, creating the illusion of longer, thicker lashes, the kind of lashes that will make other women green with envy. The treatment takes between 30 and 45 minutes to apply and lasts up 6 weeks depending on the length and quality of your natural lashes. Clients who follow skin care regimens are very diligent about after care. The work that is done in the facial room is working for a long time after the facial is done. There is not a huge list of after care items, but there are a few things you will want to keep in mind after a facial. No washing your face. Let those products work for you! Most facials are not invasive. You will get many benefits from a facial. It will bring life to dull, lifeless and congested skin. You will notice a difference after the facial. You will feel smoother, tighter and skin will be soft. These will begin on October 1st! The spa will smell amazing for the fall season. Our new inventory for fall at the boutique is coming in as the weeks go on. Keep up to date on daily news at our Facebook Page. Pumpkin has many different benefits for the skin, and many anti aging benefits. Anti Aging Pumpkin facials are 65. Hot Stone Pumpkin Pedicure with Choice of Tea 50.
while supplies last, book now. The spa offers the BEST in pedicure services Our quiet environment, and our presentation, will make your visit serene, peaceful. It’s the works! It’s over an hour long…. starting at $50. Starting with a custom temperature foot soak in our beautiful bowl. Then the… real pampering begins. This covers all of the care of the nails and cuticles. A pre treat callus cream, heel work and a leg and foot scrub, mask over the leg and foot, hot towels, brushed warmed lotion with custom DoTerra oils on legs and feet. Followed by a long massage on legs and feet. Finished with polish of your choice. We typically serve hot teas and cold water or seltzer lemon lime….or wine…or a spa favorite, our mimosa… Feel free to text or message to book 541 337 5978.